What is the chance of having a school cancellation this next week? Well, your guess is good as ours, we live in Michigan and weather is subject to change quickly. It seems like this time of year that sometimes the weather is the only news, and perhaps a little bit dramatized. At school, we tend to use the National Weather Service (NOAA) to help guide decisions. If you want to know more about weather-related cancellations, click here in regards to cold only delays or cancellations here are a couple of things to remember. Temperature only is typically called the day of not the night before as exact temperature is subject to change from the forecast to actual. As a general rule, a sustained wind chill factor of -20 or greater will be the determining factor as to whether to close or delay school. Frostbite can occur on exposed skin in a relatively short time for children out in extreme temperatures. 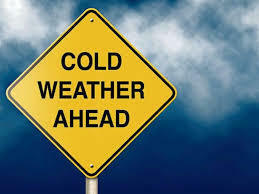 Parents are encouraged to ensure that students are appropriately dressed for these conditions while waiting at the bus stop or walking to and from school. Decisions to close or delay school will take into consideration the current conditions as well as the duration of the wind chill factor predictions.